A decadent, four-layered dessert fit for a Queen (or King)! 1) Break shortbread squares into small pieces for crumbling on top of the cream. 2) With an electric mixer, beat cream, sugar and vanilla extract on medium until stiff peaks form. Spread mixture onto a baking sheet lined with parchment paper and freeze for 3 hours. Break frozen cream into pieces with a knife and return to freezer until ready to use. 3) Process 1 1/2 lbs of strawberries in a blender until smooth (reserve remaining strawberries for strawberry filling). With an electric mixer, beat cream, sugar and vanilla extract on medium until stiff peaks form. Gently fold in strawberry puree. 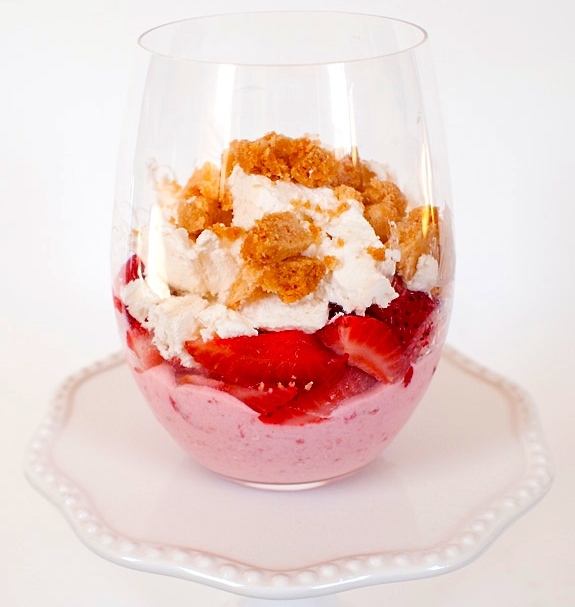 5) Divide strawberry whipped cream among 6 parfait glasses. Top with strawberry filling, followed by frozen cream, then shortbread crumble topping. Serve immediately. Tip: Add freshly chopped mint for decoration. This entry was posted in Blog, Uncategorized and tagged cream, crumble, parfait, Shortbread, strawberries.